Maryland & Virginia Milk Producers Cooperative recently named Rich and Shelby Holsopple as the co-op's 2019 Outstanding Young Cooperators (YC). The Holsopples help operate Moyers Rolling Green Acres, a seasonal grazing dairy, with Shelby's father, Glenn Moyer, and her brother, Matt Moyer. Together they milk 670 cows at two locations; one in Manns Choice and the other in Friedens, Pennsylvania. Rich and Shelby manage the Friedens farm where they milk 250 cows. Collectively the family raises 400 heifers, and cares for 1,400 acres of farmland. As Outstanding YCs, the Holsopples are invited to attend Maryland & Virginia board meetings, and will represent the Cooperative at the National Milk Producers Federation YC meetings in in Washington, D.C. and in New Orleans, Louisiana later this year. “I'm eager to learn more of the legislative process, meet fellow YCs from across the country and learn more of the inner workings of the cooperative,” Rich said. The Holsopple’s live on the farm where Shelby grew up. Rich and Shelby each bring their own set of expertise to the family dairy. As a former business owner, Rich manages the financial and employee management side of the farming operation. Shelby handles all the calf rearing for their 250-cow herd when not caring for the couple’s three teenage children. 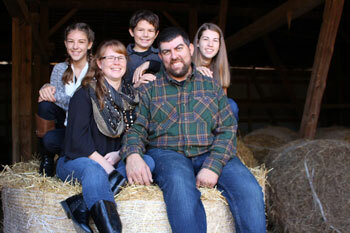 The family works together to cover milkings, feeding, hay-making and other farm work. The Holsopple’s children, Sydney, Abby and Carter are active on the farm and enjoy attending Maryland & Virginia’s YC Summer Break, the co-op’s annual family-oriented farm tour event. The family is involved in their local 4-H program and Shelby has served as 4-H leaders for the past 17 years. Outside of the agriculture community, they are engaged in their church and Rich is a board member at their children’s school, Johnstown Christian School. With the coming year of dairy networking opportunities, Rich aims to take advantage of the learning opportunities. “One goal for myself is continued education in understanding the dairy industry,” said Rich. He has served for the past three years on Maryland & Virginia’s Leadership Council, enabling him to interact with cooperative management and provide input on cooperative business. “Our Young Cooperator (YC) Program shapes future co-op leaders,” said Lindsay Reames, of Sustainability and External Relations for Maryland & Virginia. Maryland & Virginia Milk Producers Cooperative is a community of dairy farm families passionate about cultivating dairy goodness and bottling fresh Maola brand milk and dairy products. Founded in 1920, the cooperative’s farmers produce three billion pounds of milk a year for consumers and manufacturers worldwide. Our dairy farm families take pride in creating dairy products people crave, operating with passion and integrity, responsibly caring for our resources and providing a rewarding livelihood for our farmers and employees. For photographs or more information about Maryland & Virginia, visit: mdvamilk.com.